I was so excited about these new visual + sparkle = color that I had to share another just before I left you for the weekend. 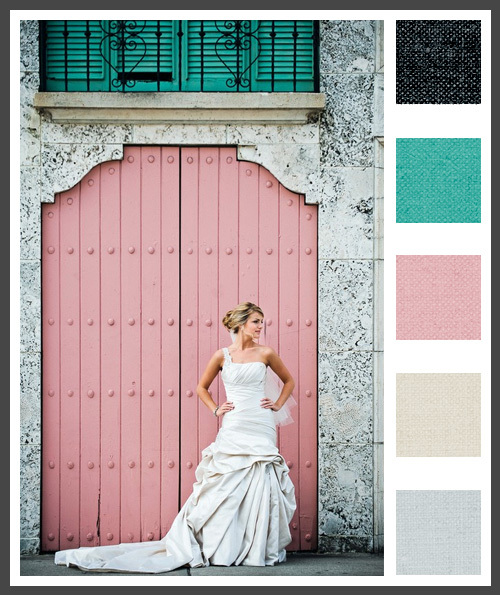 I was immediately captivated by this large, pink door and when I saw the aqua shutters right above a new Wedding Invitation color palette sprouted in my mind. Perfect for an early Spring Wedding or Quinceañera, don't you think, while there's still a little chill in the air? Many new things coming in the month ahead. I just sent out the Frank Lloyd Wright Wedding Invitations I mentioned here so I will share the final pictures of those with you as soon as the soon-to-be newlyweds receive them.